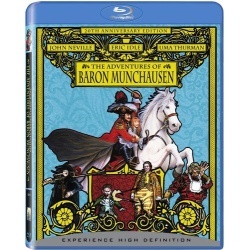 Nominated for 4 Oscars in 1989 and directed by Monty Python's Terry Gilliam (The Fisher King), The Adventures Of Baron Munchausen stars John Neville, Eric Idle and Uma Thurman. Neville is the eccentric Munchausen, an aristocrat who relies on the power of his imagination - and a crackpot band of henchmen - to defend their village from plunder. Idle plays the loyal Berthold, the world's fastest man, who hilariously outruns a speeding bullet all the way to Spain in just one hour to save the Baron's neck! When Manchausen's not collaborating with his screwball associates, he can be found walking on air - literally - with the lusciously beautiful Venus (Thurman). Filmed by Oscar nominee cinematographer Giuseppe Rotunno (Best Cinematography, All That Jazz, 1979) with stunning special effects!